A portrait of Fred Inger in the flying outfit demonstrates many of the items mentioned in his story. His waist belt carries pouches for E-3-J emergency kit, a supply of ammunition and pistol (not visible in this view). The shoulder straps were essential to carry the weight of the fully-laden belt. The gaiters provided protection against snakes, leeches and scratches. They also provided ankle support, important when walking in the mountainous terrain. Most Australians, including Fred, were preferring American-type buttoned gaiters which were more comfortable than the Australian desert-type ones. The Australian issue boots were also originally designed for desert conditions and performed poorly in mud and water. Strapped to Fred’s left leg is the heavy-duty knife. The inflatable Mae West completes the outfit. At daybreak, Inger selected a high tree with clear approaches and climbed it to look around and try to establish his position. He could see the majestic massif of Mount Kinabalu and the coastline barely visible in the distance. It was a large distance to cover in the jungle, without food and having to stay undetected, but there was little choice. He expected a search party to look after him from the air, and for this purpose he had a small mirror in his escape kit to try to signal any passing aircraft. Unfortunately, after the night’s rain the sky was completely overcast, so the mirror was rather useless. He decided that waiting at the crest would be a waste of time and decided to proceed towards the coast, trying to avoid arriving close to the town of Jesselton which was held by the Japanese. For this purpose, he set off North along a ridge. After some time, he turned East, climbing the steep edge of the ridge, then descending to the next one, climbing again and so on. Keeping his bearings in these circumstances was very difficult. He checked his course by selecting a tree on the opposite side of the ridge, walking to it and then checking back to the tree he had left. Twice he saw a clearing in the valley with a few natives’ huts and had to make detours to avoid being detected. In doing this, he had lost his bearings so he had to climb to high spots again and again to reset his course. Passing through a stream of water running along the ridge, he stopped and tried to prepare a meal. He consumed 2 Atebrine tablets and 2 salt tablets. Eating fruit or wild plants in the jungle was out of the question – many of the species were poisonous enough to kill a man. However, he had bouillon cubes in his kit. He took his vinylite map case and filled it with water. Then he put in a Halizone tablet to purify the water and two bouillon cubes. It took some time mixing with a stick for the cubes to dissolve, but in the end he had something remaining of a soup which helped him to keep going. Late in the morning he struck another clearing, then a very thick jungle which seemed impossible to hack through except for a narrow game path. Following it for some time, he run straight into a native man and woman. As he could not avoid them, he stopped and tried to make a conversation. 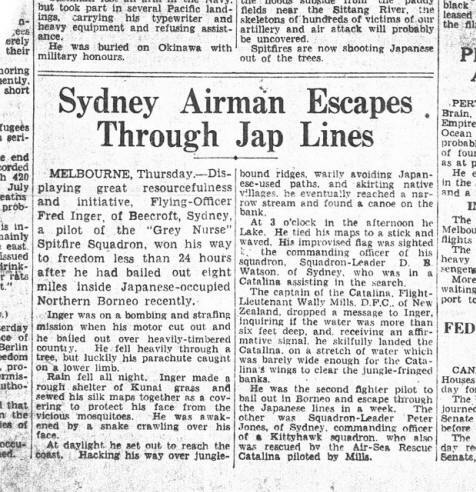 Using the simple Malay vocabulary, another item from his E-3-J kit, Inger asked if there were any Japanese in the vicinity. He understood from their answer that there were four, approximately a mile away. He gave the man a razor blade as a gift, hoping that they would not share the news about their meeting. Then he left the path and headed in the Northerly direction, climbing a very steep hill and at times hacking his way through the jungle for approximately 3 miles. It was now about noon. With all the physical strain of the day, Inger was becoming tired. His standard-issue light Australian boots were soaked with water. With their leather soles, they were not well suited for the ever-present mud and he started worrying that they would not last through the entire journey to the coast. He struck another ravine and headed West. Soon he sighted another village in an opening. Encouraged by the outcome of his first encounter with the natives, he decided to see if the inhabitants could help him. He decided that if the villagers would turn hostile, he would use his pistol to get away. To his relief, the people were very friendly and the head man spoke a little English. When asked if there were Japanese in the area, he replied that they were, but that he could made the coast without difficulty. Inger asked if someone could guide him to the coast. Initially, the chief denied. Inger tried to convince him promising a reward and that he would fly over his village with his aircraft and drop food for them as soon as he rejoined his unit. These arguments had some effect on his spokesman, especially that about food as this was usual in very short supply in the occupied territories. The Chief agreed and provided Inger with two old men and a youngster. There was a narrow stream passing nearby, and they would be setting out in two prahus (canoes). civilians in the occupied territories. Before leaving, Fred could hear a sound of aircraft circling in the vicinity. At this stage of the war, it could only be the Allied one. As the sound grew louder, he recognized it as a Catalina, no doubt sent out to search after him. In the Pacific, Catalinas were widely used as rescue aircraft due to their ability to land on water, large endurance and great downward visibility from the aircraft. Fred assessed his means of alerting the aircraft and tied a map to a stick to produce a flag. For a moment, the Catalina passed overhead and he waved, but as the prahus were under the canopy of the vegetation his sign wasn’t noticed onboard the aircraft. He knew all too well himself how difficult it was to spot any people or boats under from the air in these circumstances. They set out on the water, rowing. The stream got progressively wider, forming the Easter arm of the elongated Sulaman Lake. Fred noticed that the water became salt, an indication that the sea wasn’t far away. After an hour’s paddling, the Catalina, piloted by New Zealander F/Lt Wally Mills appeared again, circuiting over the jungle. Fortunately, there were now in the open area. Inger waved his improvised flag and signalled with the mirror. This time, Fred’s commanding officer, Sqn/Ldr Watson, who was onboard the Catalina guiding the search, spotted his signals. The Catalina turned around and passed low overhead Fred dropping a message. It fell in the water to far away to be fetched. A second attempt was made. This time the message fell very close to Inger’s prahu and he was able to recover it. A short note was asking him to indicate by waving if the water was more than six feet deep to allow the Catalina to land. Fred inquired from the natives, they answered the affirmative and he waved. At 3 o’clock pm Mills skilfully landed the Catalina on a stretch of water which was barely wide enough for the aircraft’s wings to clear the jungle-fringed banks. Inger’s adventure was over. Before departing, he gave the natives all the tinned foods carried by the Catalina. He also added his signalling mirror as the gift for the head man of the village. He knew that mirrors were highly regarded presents among the tribesmen. Fred Inger won his way to freedom less than 24 hours after he bailed out over the Japanese-occupied territory. His success was a result of his resourcefulness, which is readily evident from his story, and a degree of luck. 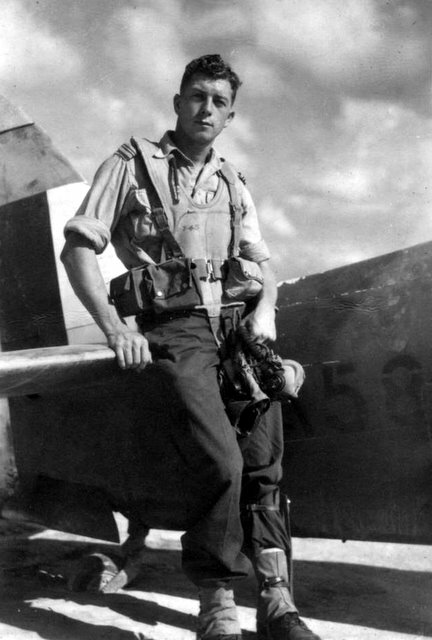 That same week, another RAAF fighter pilot managed to bail out over the jungle and escape – Sqn/Ldr Peter Jones of one of the Kittyhawk squadrons, also picked by Mills and his Catalina. Fred’s post-war career was also to provide some thrilling moments. While commanding the Target Towing and Special Duties Flight in 1947, he was obliged to belly-land a Beaufighter after collision with a tree. Later he survived a nasty helicopter crash, wrestled with engine failures in Lincoln bombers and went on to be part of the F-111 procurement program. A modest man who would not talk about his own achievements, Fred Inger reportedly once said that ‘telling stories was for other people to do‘. I’m glad I could help with the latter. 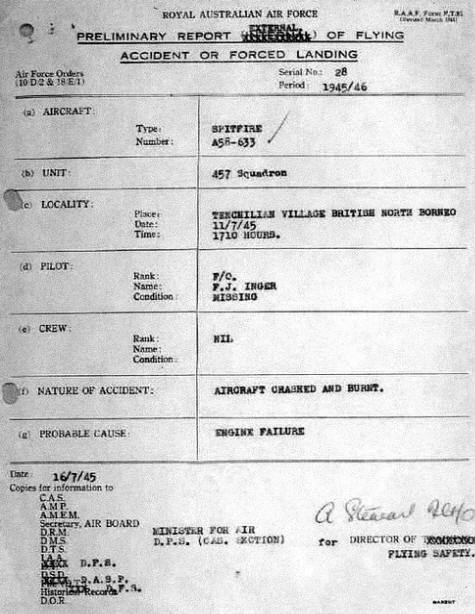 Facsimile of the Accident Report describing Inger’s crash. The author would like to extend his warm thanks to Tim Prosser and John Inger for their essential help in providing the material for this article. I experienced Fred Inger’s airmanship whilst travelling en route Bankstown/Woomera when he was the CO no1 ATU. There was a loud bang followed by silence and a windmilling prop of our new DH Otter but Fred and his mate up to it as we entered into a long distance glide to land on an airfield in Victoria. As an attached Pommy fitter I had the good fortune to spend time in the air with Fred and his mates in the role of ‘flying spanner’. Jack Frost UK. I am Wally Mills’ daughter. I grew up hearing the tale of this rescue, and the bond that connected Dad to Fred for the rest of their lives. They only met once more after the war. My father finished Veterinary Science after the war and went on to set up the third veterinary practice in Queensland. He continued flying small planes and later gliders. He worked full time until the age of 71. His last flight took place six weeks before his death at age 78, in 1995. I just happened to run across a short mention of this in the paper listed above and decided I’d look up more information – thanks for posting this!